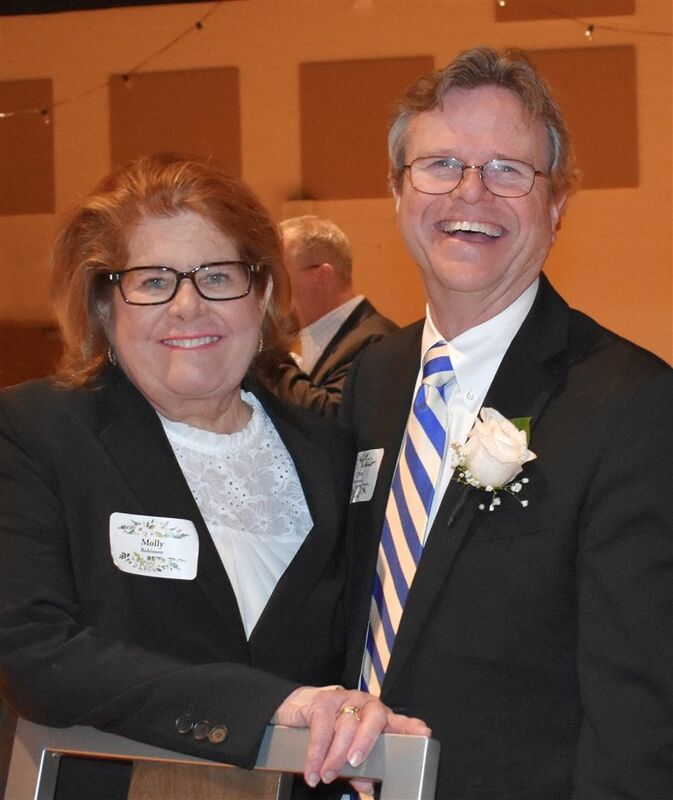 Molly and Dave Robinson, residents of Bloomfield Hills, were honored for nearly 30 years of volunteer service to Marian High School at the school’s Celebration of Thanks, an annual reception for donors and volunteers. The Board of Directors and Sr. Lenore Pochelski, IHM, Head of School, acknowledged over 100 members of the Marian community for their contributions at this gathering. Molly and Dave are parents of two alumnae daughters, Kate Robinson Bongiorno ’94 and Macklin Robinson Pappano ’04, in addition to two sons, Brendan and Keenan. The Robinsons have been part of the Marian community since 1990 when Kate first entered Marian as a freshman. Molly immediately joined the Mothers’ Club, often providing hospitality, welcoming visitors, recognizing faculty, staff, and volunteers, and working on Calico, the school’s signature fundraiser, Sr. Lenore told guests at the reception. Dave joined the Dads’ Club, working behind the scenes to ‘make things happen,’ a job familiar to many Marian dads. It wasn’t long before Molly found her niche at Marian – helping out or chairing events from receptions for retiring administrators to Marian’s 50th anniversary dinner to Sr. Lenore’s jubilee two years ago. “This is Marian’s 18th Celebration of Thanks,” Sr. Lenore said, “and Molly has been here from the beginning – planning the receptions, designing the flowers, consulting on the menu and the favors each year.” In addition, Molly served as Mothers’ Club president and a member of the Board of Directors. Sr. Lenore cited Dave as the supportive spouse, the first to pitch in and help with everything from setting the scene to making deliveries at events and activities. Seniors from the past 15 years or so remember Coach Robinson as a popular and successful Senior Football coach, one with more wins than losses. He has even written Senior Football articles for school publications. Several years ago, when Marian was preparing for the school’s first major capital campaign, Molly and Dave each chaired one of eight task teams, identifying dozens of recommendations from nearly 150 alumnae, parents, faculty, staff, and friends who evaluated the condition of eight areas critical to the school. The celebration concluded with the Marian Melodies singing a blessing song to honor the Robinsons and the 100 other donors and volunteers at the event.